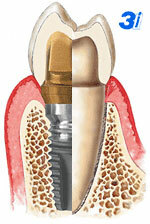 Dental implants are the modern alternative. Instead of cutting down two perfectly healthy teeth, a periodontist inserts a dental post (dental implant) into the jawbone to replace your missing tooth root. This post becomes solidly fixed into your jaw (like a natural tooth root). Dr. Hanchett then places a crown onto this artificial tooth root that looks, feels, and functions like your natural teeth. So if you are looking for a Dental Implants in Cheboygan, call us today and see what a difference a beautiful healthy smile can make.